The 5th Annual Kids Golf Day turned Fenway into a fairway and proved to be above par! 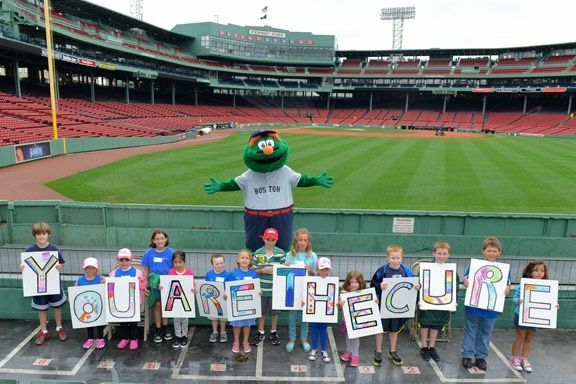 Bringing the event back to the historic Fenway Park, this year's event welcomed over 150 children and families impacted by cancer. Children who are currently being treated, in remission, survivors, or have a family member affected by the disease, joined together for an unforgettable day full of laughter, smiles, and hope. The fun started before families even arrived at Fenway. A Boston Duck Tour Boat surprised guests in the parking lot and brought them to the ballpark in style. Metro Mini Links transformed the lower concourses into a fun 9-hole miniature golf course. In addition, PGA professional Andrew Walkley and his team from Eastward Ho! led the kids in a golf skills clinic, practicing swing, stance and driving through interactive drills. Even Wally the Green Monster had a chance to work on his swing while spending time with the children. Families then got to explore special parts of Fenway Park through ballpark tours and a scavenger hunt for the kids, even getting to visit the Red Sox dugout! Everyone got to test their arm at the fast pitch station. The kids' spirits and creativity were exemplified at the Photobooth, arts and crafts, and face painting stations. One little boy kept his family laughing when he requested a mustache and goatee to be painted on his face! New this year, we were excited to have American Girl of Natick Mall and Museum of Science join us. When the activities ended, everyone gathered to enjoy a lunch filled with popular Fenway fan favorites and a chance to take photos with the World Series trophies. Frank Strauss, Founder and Chairman, presented a video from an extra special guest. Everyone watched in delight as David |Big Papi| Ortiz wished all of kids well and told them |to have a great day in his home!| When the video concluded, Frank Strauss shared the exciting news, that a College Scholarship will be given to two amazing young adults this year. The 2013 College Scholarship recipients are Monaa Leslie and James Gordon, both of whom are cancer survivors and will be attending college this fall. They will receive their awards on the field at a Red Sox game later this season! The Foundation was honored to have J.P. Morgan as a Miracle Sponsor and Beacon Consulting Group as a Hope Sponsor. Both J.P. Morgan and Beacon Consulting Group had dedicated employees who volunteered their time at this community event, joining other volunteers from the industry to lead activity stations and ensure the kids were having the |best time ever.| The kids ended their day with goodie bags filled with treats from our event partners. This event was an unforgettable day for Expect Miracles staff, volunteers, and families alike. We are honored to be able to provide a fun-filled day for such inspiring and strong families, and hope Kids Golf Day continues to be embraced by the community.